Motorists caught speeding outside a primary school were given the option of avoiding a fine by attending a special court where the judges are children. The "Kids' Court" was set up in St Aloysius Primary School in Lisburn, County Antrim, on Thursday. In front of a panel of young pupils, drivers had to explain why they had broken the 30mph speed limit as they passed the school on Ballinderry Road. Police hope meeting the children face-to-face will change drivers' behaviour. Motorists who did not want to participate in the initiative had to pay the usual speeding fine and accept penalty points on their driving licences. But those who did attend the Kids' Court got a lesson from the young judges on the dangers of speeding and faced questions from the children about their road safety knowledge. The educational project has already been introduced in some other parts of the UK but this is the first time the method has been employed in Northern Ireland. School governor Martin McDonald said: "Our location on the busy Ballinderry Road makes our pupils and parents veuerable when dropping off or collecting pupils or when walking to and from school. "Road safety is continually promoted throughout the school. "However, the Kids' Court initiative allows us to be proactive and highlight to drivers the vulnerability of our children aged 3-11 years. "If we manage to change the mindset of even a few drivers, the initiative will have been effective and our pupils much safer." 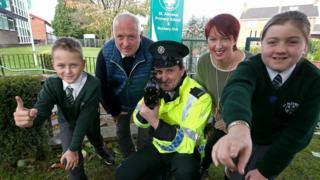 The Police Service of Northern Ireland (PSNI) has been working alongside the school's staff to educate the pupils about road safety. PSNI road safety education officer, PC Jacky McDowell, said the children were now "educating drivers who have exceeded the speed restriction outside their school, as to the potential of what could have happened. "This has personalised the message to those drivers that have agreed to meet with the pupils," he said. "The goal of the project is to change driver behaviour through this experience of personally meeting with the pupils." The constable added: "This isn't about trying to catch people out - it's about making our roads safer for all - children, adults, pedestrians, cyclists or motorists." The chairman of Lisburn and Castlereagh Policing and Community Safety Partnership (PCSP) congratulated the school on delivering the road safety initiative. "We need to take proactive measures to prevent these unnecessary fatalities and injuries, and working with our young people is a very effective way to deliver the road safety message," Cllr Aaron McIntyre said.